This week, residents from an Avondale Heights nursing home were treated to a demonstration of canine tricks thanks to The Lost Dogs’ Home and Planet K9 Dog Training School. Neil, Carl, Colin, James and the nursing home’s recreation staff Heather and Peter were entertained by the team from Planet K9 which includes canine stars Astro and Comet. Astro amused the group with his doggie limbo skills while Comet demonstrated his agility prowess and unique ability to retrieve six hoops and place them on a pole, all within two minutes! After the canines showed off their skills, it was time for a human challenge where recreation staffer Heather had to ‘pin the tail on the puppy’! In case she wasn’t sure what to do, Comet spun around three times and promptly hoisted a hoop onto the puppy’s tail! Then it was time for Peter to take the dog agility course. Yes, he weaved, hurdled, jumped through hoops and even crawled through the dog tunnel! The day was particularly special for Neil, a resident of the Ron Conn Nursing Home. He was allowed to adopt Bonnie from The Lost Dogs’ Home last year and with some training and close attention from Planet K9 and the staff at Home, she has become a well behaved and much loved occupant of the nursing home. Neil’s health has improved markedly since Bonnie has been by his side and it seems she has not only had a therapeutic effect on Neil, but many of the home’s other tenants. “She is like my daughter and I am very lucky to have her,” said Neil. “Her favourite trick is to shake hands when she meets somebody new”. The Lost Dogs’ Home’s Shelter Manager, Sue Conroy, is a firm believer in the therapeutic benefits that pets can have on their owners and the people around them. “Throughout my 22 years at the Home, I have often seen the very positive impact pets have on their owners. 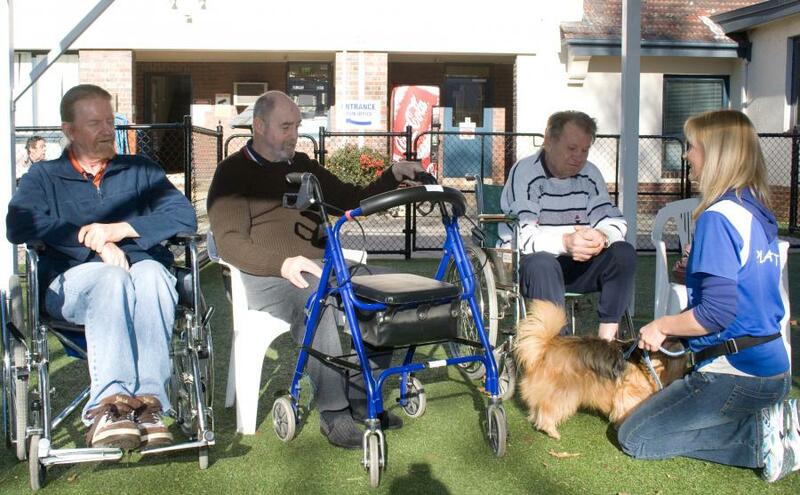 On many occasions, we have placed particular dogs and cats with elderly, isolated or sick people knowing there will be a social or health benefit to the owner and the pet will be well cared for,” said Sue Conroy. Comet and Astro are owned by Planet K9’s head trainer and director, Nicole Beasley. They were both adopted from The Lost Dogs’ Home and are evidence that any dog, with the right training, can become a canine star!